Introduction: the low adherence in the highly effective antiretroviral treatment HAART is associated with worse health outcomes. In addition to infectious comorbidities, many patients with HIV / AIDS have associated psychopathology, drug dependence and socioeconomic problems. There is a high frequency of abandonment of therapy in our environment. 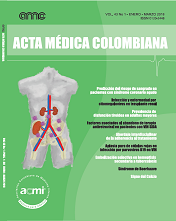 Objective: to identify the variables associated with the abandonment of HAART therapy in patients with HIV from a third level hospital in Colombia. Methods and Results: descriptive cross-sectional study: 51 patients belonging to the program during one year were included; 12 patients (23%) had adherence to treatment, 32 (62%) had a history of psychoactive substance use and 33 (64%) had some psychiatric pathology. The factors that were associated with non-adherence were psychopathology and the poor support network.